"A custom orthotic puts your foot in an ideal position at every stage of walking, running and pivoting, You'll be at your most strong and at your maximum efficiency. "- David A. Schofield, the president of the American Podiatric Medical Association. At our Chiropractic clinic we offer our patients a wide range of high quality custom orthotics. Conveniently located near La Jolla in the UTC (University City) area of San Diego, our office will skillfully create a 3-D orthotic mold of your feet. This careful process ensures that your new custom orthotics will properly address and best treat your specific underlying condition. Not everyone needs orthotics! Imperfect walking gait or running stride can cause repetitive stress to joints and muscles. Running and gait-training clinics (routinely conducted at our office) are all that some of our patients need to overcome shin, knee, or hip pain. For others, structural problems with the feet must be addressed. Excessively high arches, low arches, too much or too little flexibility in the joints of the feet, and other mechanical/structural problems must likewise be addressed with structural solutions. The right orthotics and footwear can enable patients with structural issues to compensate sufficiently and often go on to higher levels of performance and injury-free enjoyment of their sports and other daily activities. 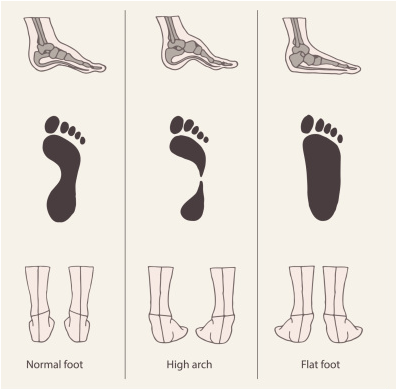 The key to orthotics is that they are fabricated in the medically correct way to fit your body and your specific needs. Unfortunately, having orthotics made correctly these days is the exception rather than the rule. Read on! How are our orthotics different? Once the province of podiatrists, chiropractors, and sports medicine doctors, today orthotics are being made by clerks in shoe stores and sold across the counter at convenience stores. How are those orthotics any different from the pricy ones made by doctors? Orthotics sold off-the-shelf in shoe stores are not custom products. They are generic in their size and shape. They provide support, lifting the arches of the wearer to some pre-conceived position of normal (typically 7 degrees of arch inclination). But everyone's natural arch is different. Some people have long arches, some short, some are naturally 4 degrees, others 12 degrees. Off-the-shelf or 'ready made' orthotics are much like purchasing a pair of eye-glasses off a drug store rack. They may help a bit, they may make your eyes hurt, but they almost certainly will not provide the same level of correction as lenses ground by an optometrist specifically for your eyes based on a thorough eye exam. Professionally made custom orthotics begin by taking a mold of the foot in its neutral position. But there's a trick to this. Once you stand, your foot shifts, often causing your arch to drop. If that does not happen then you probably don't need orthotics and Dr. Berkoff will tell you so! If it does happen then the foot mold should not be taken in the standing position since it will be making an impression of a rotated or collapsed foot, not a neutral one. Unfortunately the vast majority of custom orthotics–including those made by most doctors today–are derived from a computer image taken of your feet while you are standing. Why? Because it is easy. Dr. Berkoff takes the extra steps required to make orthotics which will restore your feet and ankles to your unique, correct position. While seated, he carefully positions the joints of your feet and ankles into their perfect neutral position and then takes a custom imprint of each foot using a composite mold from which your orthotics will be derived. Only through extremely careful positioning and technique performed in the seated, non-weight bearing position can a proper orthotic mold be created. This takes time and experience but the difference in the finished product is night and day. Think of it as the grinding of custom lenses to restore your eyesight to 20/20. Instability of the feet and ankles can cause excessive rotation and motion through the knees and hips. An unstable 'base' puts extra strain on the lower back predisposing it to injury and causing early fatigue and back ache with sustained standing. But the most dramatic results achieved through the use of custom orthotics are as part of a treatment plan to cure disorders of the feet (Plantar Fascitis), knees (Patello-Femoral Syndrome or 'Runner's Knee'), and hips (Ilio-Tibial Band Syndrome). Custom orthotics are often a key factor in overcoming chronic pain conditions associated with exercise and sports. Dr. Berkoff has been using his own orthotics for more than a decade which has enabled him to continue to train and compete in endurance sports including marathon and triathlon. We offer a wide selection of custom orthotics: sports, women's dress, men's dress, an everyday comfort line, and more. Our orthotics come with a 6 month guarantee in which any necessary alterations are complimentary. If we cannot get your orthotics right, we will take them back and refund your purchase. We also keep a copy of your foot mold on file so that should you ever need to replace or add to your orthotic collection, it can be done as easily as a phone call or an email to our office. We can even ship your orthotics anywhere in the world! We sell our orthotics at a substantial discount to our patients. Getting people fixed and back to their sport is Dr. B's passion.